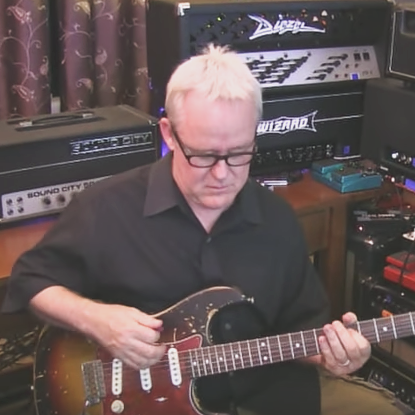 Guitarist Tim Pierce knows all about getting great guitar tones. A first-call Hollywood session guitarist since the late 1980s, Tim has played on records by a who’s who of top artists, including Elton John, Michael Jackson, Madonna, Christina Aguilera…and the list goes on. Try Tim's online Masterclass for free! Access over 400 videos by clicking this link. We sat down with Tim and began by asking him what it takes to be a successful session player in 2017? TP: What hasn’t changed in all my time is that you need the ability to call up styles and sounds from every decade: from the ’50s all the way up until now. You need to have on tap the guitar parts that are part of the musical culture in all those decades. What does that mean in terms of gear, starting with guitars? TP: It doesn’t require a lot of guitars. Certainly, if you had a good Stratocaster and Les Paul style guitar, you could do just about everything. You could then branch out into having a Tele. And in terms of amps? Assuming you’re laying down your parts in a studio, and not doing them from your home studio, you’ll need a convenient way to bring those sounds with you. For a lot of people, it’s modeling amps (i.e. Kemper, Fractal, etc.). If not, I’d get a low-wattage Fender or Vox style amp or a low-wattage boutique amp along those lines. You don’t need more than 30 watts. What about when you need that big Marshall sound? TP: You can get most of those distorted tones from all the great pedals out there. The need for big Marshalls and Hiwatts is not as prevalent these days. 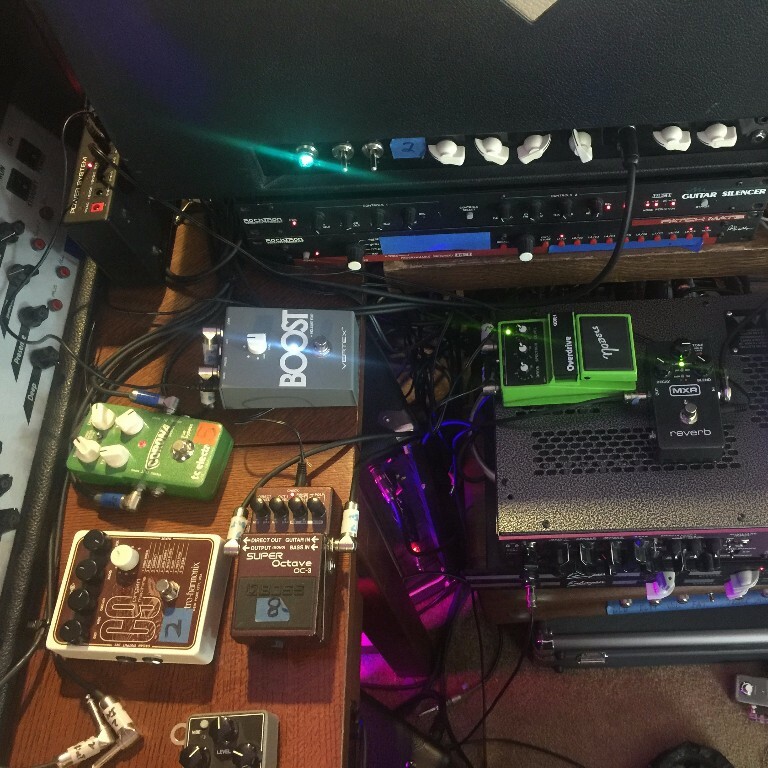 What are your important pedals for a session pedalboard? The main thing I use is the type of pedal that naturally pushes the front end of the amp. It could be a MXR Micro-Amp, ZVex Super Hard On, or the Vertex Boost—the kind of pedal that just explodes the input of the amp, and works well with a very natural sounding overdrives, like the vintage Nobels ODR-1. Ideally, you want to have three levels of dirt pedals: boost, overdrive, and flat out distortion. What about delays and modulation? I use delay disguised behind the signal. I’ve never liked to hear a delay trail, but I like it to make the actual part I’m playing just float a little bit. And much to my great pleasure, people love reverb, so I have a reverb pedal and I’ll use it as much as possible. The way I get modulation is from a little bit of chorusing that happens in all my delay trails and that’s as far as I go. Leslie is also a good one, but after the Leslie, there’s not much else I will instinctively use. If somebody asks, I’ll throw on the Whammy pedal, but my instinct these days is towards not effecting the guitar sound, for better or for worse. If somebody’s sitting there saying, “Give me something crazy,” I’ll step on the Whammy, or the POG, or deliver a Mellotron sound. What advice do you have that doesn’t apply to skill and gear? You need a strong ego, but you have to be willing to erase that ego. If a young artist tells you what you’re doing is not appropriate, you need to switch gears and do the opposite thing, so your ego has to be able to be obliterated, but then you need to bring it right back strong when it’s appropriate. Some of that might apply to live playing, but this is much more critical in the studio than in the live situation.